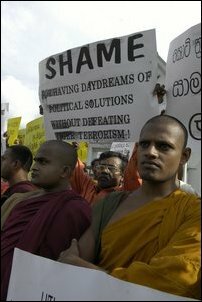 Nearly one thousand members of JVP and the NPM participated in this demonstration which ended with NPM Chairman Dr. Gunadasa Amarasekara handing over a memorandum to the Secretary of the President, Lalith Weerathunga at Temple Trees, the official residence of the President of Sri Lanka, the sources added. Demonstration started near the Town hall and marched to the Temple trees. Although, Sri Lanka Government has banned demonstrations in the High Security Zone (HSC) around the Temple Trees under Emergency Regulations, the demonstrators were allowed by the police and the presidential security division to enter the HSZ and demonstrate around Temple Trees.